If your organization is growing and changing, perhaps adding new locations, acquiring new companies, or deploying new ecommerce websites, the Pacejet API might help you support improved quoting and shipping processes that save time and money. For example, if ecommerce expansion is on your radar for this year you could use the Pacejet API to integrate freight/LTL shipping options or expanded parcel choices into your new web sites. Alternatively, if your company acquires a new division with a custom, older, or different ERP system than the rest of your business, you could use the Pacejet API to easily integrate advanced quoting and shipping functionality without replacing the ERP. Whatever your quoting and shipping needs look like, the Pacejet API provides a modern, open, RESTful technology solution for leveraging a broad range of shipping services from our network of LTL, Parcel, and 3PL carriers and services. 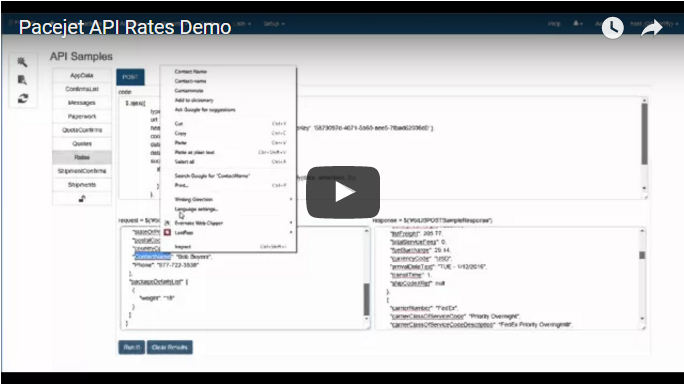 Today's post provides some additional detail on the Pacejet API with links to new demo videos that introduce the technology and demonstrate how it works. The central purpose of the Pacejet API is to leverage existing platform functionality for quoting, packing, shipping, paperwork, connectivity with carriers, etc... but open up the application for easier and more flexible connectivity with any software or cloud system. New RESTful endpoints such as Shipments and Quotes allow software or cloud applications to easily POST order or shipping detail to Pacejet, use standard Pacejet features for quoting and shipping, and then GET processing results with carrier detail and record it in ERP, WMS, or Ecommerce systems. 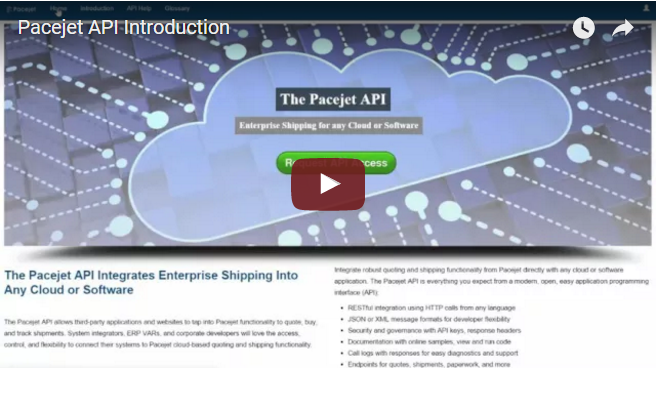 The new Pacejet API Introduction video (click here or the image below) provides a high-level introduction to the RESTful technology, help and training videos, online samples you can run without code, built-in request/response logging, and more. The Pacejet API supports both interactive and high-volume asynchronous workflows that can be easily integrated into any type of ERP, WMS, or custom software system. For the interactive workflow, users click a link or button in their ERP to activate Pacejet, pack up a shipment, rate-shop (if desired), process the shipment, and updates are applied to an ERP or other system automatically. The interactive shipping process is intuitive, consistent across parcel, LTL, 3PL, and easy to extend or change with new carriers over time. 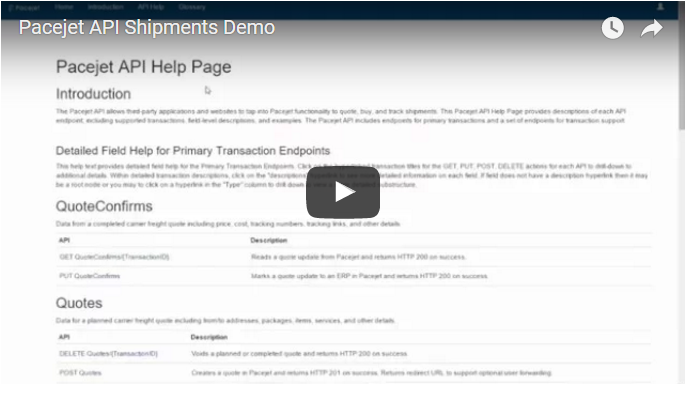 Click here or the image below to view a demo of how basic interactive shipping integration is supported by the Pacejet API. Despite plummeting fuel prices the need to reduce costs remains a top priority for shippers, so the Pacejet API makes it easier than ever to integrate interactive freight quoting into your software or cloud systems. Users can click a link or button in their ERP to trigger order data transmission via the Pacejet API, standard freight quoting with rate shopping is then used, and carrier selections and pricing can then be retrieved and recorded in the integrated ERP, WMS, or other software. 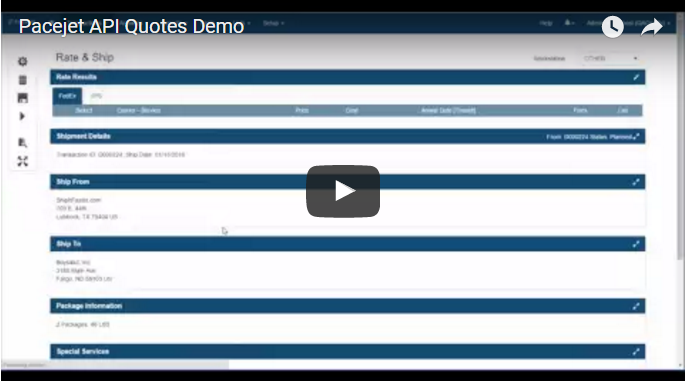 Click here to view the new Freight Quoting demo (or click the image below) and keep in mind that freight quotes can be integrated to many order types such as sales, transfers, field services, purchase orders, and more. Ecommerce websites and many other types of applications can benefit from fast and simple access to carrier price and service information, so the Pacejet API provides a specialized Rates endpoint to support this important use-case. 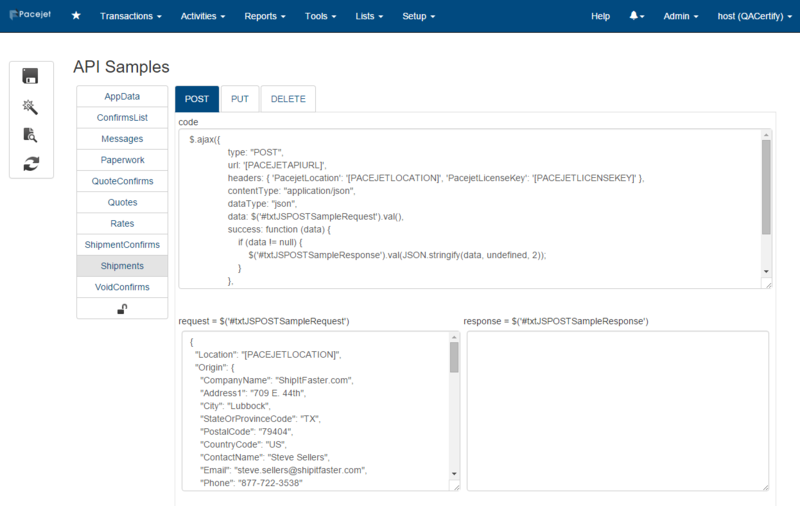 With the Pacejet API Rates endpoint, applications make one call to return all of the prices, costs, services, transit-times and more from many carriers. ERP, WMS, or other software can send in as much detail on packages, weights, dimensions, and items as is available and optionally use advanced Pacejet features like "smart auto packing" to retrieve very accurate price quotes on shipping. Click here to view the new demo on API Rates (or click the image below). 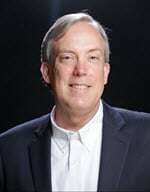 Interested in learning more about how the Pacejet API might work for your specific needs? Ready to test it for an application you already have in mind? The team at Pacejet is excited about the new flexibility and adaptability of the Pacejet API, so reach out and contact us if you have questions about how it might work for your business.